218 Million Americans Have This Carcinogen In Their Tap Water — Do You? We usually don’t think twice about the safety of tap water. It’s safe to drink as far as we’re concerned, because we are lucky enough not to live a third-world country. Most restaurants sell unfiltered tap water and while most people don’t care for the taste of chlorine, they also don’t usually question its safety or that there might be other things swimming in their water that they wouldn’t want in their bodies. Chlorine is added to our drinking water as a disinfectant. The amount should be small enough not to raise any health concerns. However, there are byproducts of chlorine that may increase the risk of cancer in some people, as some studies suggest. 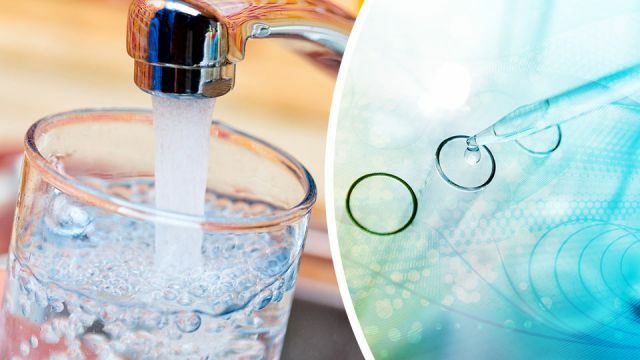 Chlorinated drinking water can have many other terrible side effects than just an increased risk of cancer, including liver problems, poor sperm count, fatigue, dizziness, childhood asthma, rashes, kidney problems, dry scalp and a weakened immune system. A reverse osmosis system can help to remove chlorine from your drinking water. In 2016, the Environmental Working Group released an analysis of more than 60,000 tap water tests that were conducted all over the United States. The report confirmed that 218 million Americans have the carcinogenic chemical chromium-6 in their water — yikes! This chemical has been linked lung cancer and to stomach cancer, but so far only the state of California has set a legal limit on chromium-6 in tap water. While California’s goal is not to exceed 0.02 parts per billion of chromium-6, the legal limit is unfortunately 500 times higher than that. The Environmental Protection Agency has ordered testing on 81 contaminants but has only set regulations for one… a full two years behind schedule. Lead is a toxic chemical and the Environmental Protection Agency has set the legal amount of lead in drinking water to be zero. Lead can accumulate in the body and lead to serious health problems. In children, these symptoms can be learning disability, slow growth, hearing problems, hyperactivity and anemia. In adults, common problems are hypertension, increased blood pressure, decreased kidney function and reproductive problems in both men and women. In pregnant women, lead has been linked to abnormal fetal growth. Lead can also affect the nerves. According to the EPA, however, it is safe to bathe and shower in lead-contaminated water, since the skin does not absorb lead. How does lead get into your water if it’s not added? Well, the corrosion of pipes leads to chemical reactions with water. This is especially true in areas where houses were built before 1986. If that sounds like your home, check your local water supply for lead contamination. While the three toxins mentioned above are the most common in our drinking water, others can also be found. Our increased use of birth control pills and antibiotics adds to the contamination of drinking water. Another problem is the overuse of over-the-counter medication that makes its way into our drinking water. Unfortunately, there is no law against the flushing of medications in the toilet or down drains, although hospitals and private households have been discouraged from doing this practice. Currently, there is no evidence that this brew of medication has a negative effect on the human body, but this seems to be just a matter of time. To this day, more than half of unused medications are simply discarded rather than being properly disposed of. These drugs will sooner or later end up in our drinking water and no filtration system will be able to remove them. Avoid purchasing medication in bulk. Stop flushing medications down the toilet. Take old medications to a pharmacy for proper disposal. There are a number of ways to test your tap water for specific toxins and chemicals. Home testing kits usually come in packages with colored testing strips so you can easily tell what’s showing up in your water supply. These can be ordered online for as little as $12 from sites like Amazon. Once you have results, you can start researching options for filtration systems that can remove harmful chemicals from your drinking water. You may also get information from your local government about your tap water. Some cities even provide free test kits to their citizens. The city of Portland, Oregon, for instance, offers free lead test kits to all Portland-area citizens. In 2016, the Portland Water Bureau even reached out to childcare facilities and schools to offer free testing of their water. Now that’s impressive! It is in your hands to protect you and your family from harm — and this includes what’s in your drinking water! While you may feel powerless, you do have the option to write to politicians and agencies to make your voice heard. Hey Buddy!, I found this information for you: "218 Million Americans Have This Carcinogen In Their Tap Water — Do You?". Here is the website link: https://www.thealternativedaily.com/218-million-americans-have-this-carcinogen-in-their-tap-water/. Thank you.